“Get Healthy for Life” is The Ultimate Prescription and Practical Solution for Living Disease-free. 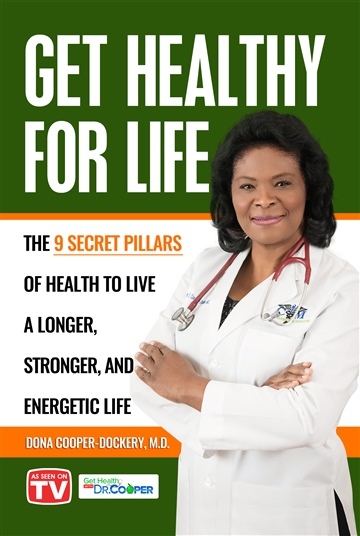 In it, Dr. Dona Cooper-Dockery reveals the 9 secret pillars of health to live a longer, stronger, and energetic life. You will probably never read about these pillars in any other book or learn about them from your doctor but they are the cornerstone secrets to vibrant wellbeing, longevity, and disease prevention. This unique program has revolutionized the health of Dr. Cooper-Dockery’s patients, many of whom are now disease-free. Others are enjoying better health on fewer medications. Healing from nature. The influence of sunlight on depression, osteoporosis, and high blood pressure. Healing with timely rest. The importance of sleep in the prevention of obesity, diabetes, and other lifestyle diseases. The need for access to healthcare screenings. The impact of social relationships, happiness, optimism, and faith on your overall health. Dona Cooper-Dockery, M.D., is a physician, author, and speaker who has dedicated over 25 years to positively changing healthcare outcomes both nationally and internationally. She holds active memberships in the American Academy of Lifestyle Medicine and the American Medical Association. Dr. Cooper-Dockery also authored the health study series, My Health and The Creator, and also writes for and produces the health magazine, Get Healthy. Her latest books, Get Healthy for Life and Fourteen Days to Amazing Health, outlines various success strategies that will empower readers to take control of their health, believe that there is an alternative to medications, change their paradigm, and a live happier, healthier, and more fulfilled life. She is actively engaged in various communities providing healthy lifestyle seminars and free medical care, not only in the USA but also in countries such as Haiti, Jamaica, Europe, and the Philippines. She is the host of the popular TV show, Get Healthy with Dr. Cooper, which airs bi-weekly on local TV, including Fox. To learn more or to get health resources, please visit www.Cooperinternalmedicine.com and www.Gethealthywithdrcooper.tv. Dr. Cooper-Dockery is also the founder and director of Cooper Internal Medicine and the Cooper Wellness and Disease Prevention Center where patients are not only diagnosed and treated using traditional healthcare approaches, but she also emphasizes uprooting the causes of chronic diseases through lifestyle modifications. Her highly effective 12 weeks to wellness program has had significant life-changing results on her patients. Many of whom are enjoying more health with less medication, some have even gotten off medication entirely! These patients have reversed diabetes, improved blood pressure, others have lost weight, reduced cholesterol, or decrease the risk of coronary artery disease and early death. Now it's your turn to Get Healthy for Life! Go to www.Cooperinternalmedicine.com and www.Gethealthywithdrcooper.com to start your journey.